If you’ve been to High Holiday services before, then you’ll see that Shabbat morning services are quite similar to those, with three major exceptions: there will be no shofar blowing, services are significantly shorter, and there is food at the end of the tunnel. If that was helpful to you, then great, you can stop reading right now. If not, let me walk you through the experience. Before we begin, I want to note that most of the natives are friendly and will be more than happy to help you out, so feel free to reach out if you have a question. Really. Also note that cell phone use is forbidden on Shabbat (and generally not encouraged in the synagogue), so plan accordingly. As you enter, make sure that you are appropriately dressed. For women, this means wearing a longish skirt and a conservative top. If you are married, you will want to cover your hair as well. For men, make sure that you have your head covered. Most synagogues have a basket with kippahs at the door. 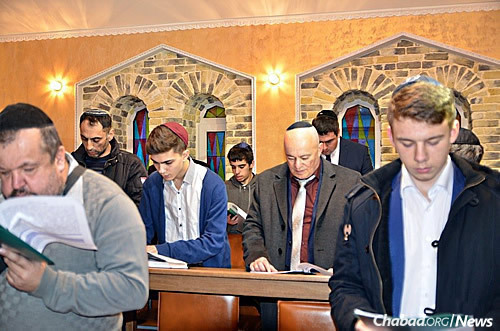 As you look around the room, you will notice that most of the men are wearing a prayer shawl called a tallit (or tallis) draped over their shoulders. 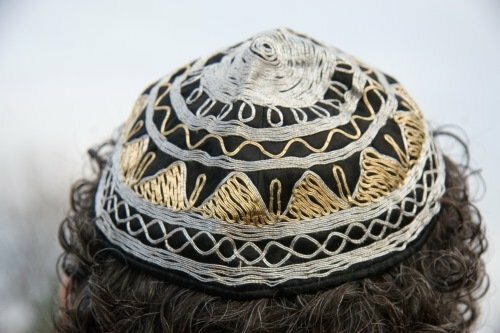 In most Ashkenazic communities, we start wearing them only after marriage. 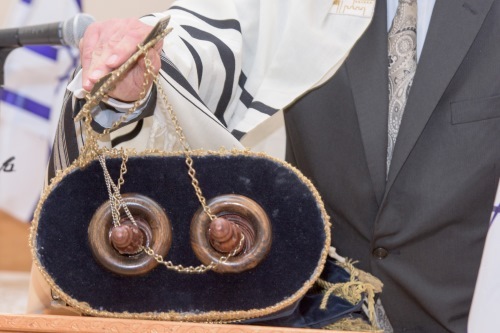 In all likelihood, the synagogue has a rack with some spares that you can use. Now you need books. The standard prayerbook—called a siddur—contains all the prayers for (almost) every day of the year, so you’ll probably be starting several hundred pages in. 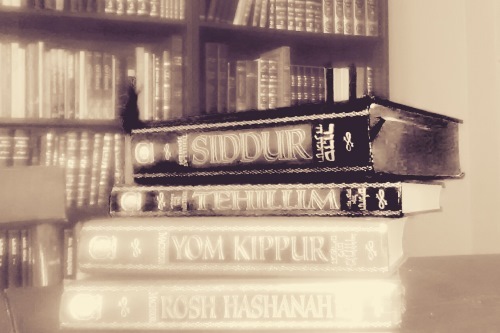 If you are attending services at Chabad, chances are that the congregation will be using the blue-bound siddur published by Kehot Publication Society. It has Hebrew and English texts, Hebrew on the right and the English translation on the left. You may also want to nab a Chumash, the Five Books of Moses. There are lots of editions out there, replete with translations and commentaries, so select one that looks right for you. Now that you got your gear, make your way to a seat. Remember, in traditional Jewish services, men and women sit separately. Now that you’re sitting, let me tell you what you can expect this morning. For your convenience, I will be pointing out the prayers as they appear in the Chabad siddur. If you are using another edition, don’t worry; the pages may be different, but most of the prayers are the same. In the front of the sanctuary, you will notice a large cabinet with a curtain draped over the front. Called an ark (or aron hakodesh), it contains the Torah scrolls, which are read during the services. The prayers will be led by the cantor, also known as the chazzan. He will begin and end each paragraph in Hebrew out loud. While most of the prayers are for everyone to say, there will be some parts of the services that only he will say, with everyone else responding as indicated in the siddur. The most important (and common) response is “amen.” When you hear people saying it, just join right in. At a number of points, the various sections of the prayer will be bookended by kaddish, an Aramaic poem praising G‑d. Sometimes this is said by the cantor, and other times it is said by people who are mourning departed loved ones. Even if you are not saying kaddish, you can join in with everyone else in saying your Amen at the appropriate points. If you are more comfortable in English, do say the prayers in that language. After all, prayer is a conversation between you and G‑d, and you need to know what you are saying. Also, be sure to say the prayers, not just skim with your eyes. Note that I will not mention every single paragraph or kaddish, since that would be information overload for some people, and you can readily see them in the siddur for yourself. Also note that a typical Shabbat morning service lasts between 2½ and 3 hours, but that can vary based on the congregation’s pace and the loquaciousness of the rabbi. Introductory Hymns (pages 181–202): A selection of psalms and other praises to G‑d, you can think of these as a “warmup” for the long run ahead. While most of them are said quietly, you may discover that some of them will be sung in unison, such as the alphabetically organized litany of praise called “HaAderet VehaEmunah,” found on page 191. Shema and Its Blessings (pages 203–210): After a kaddish (page 202), we begin building up to the Shema, perhaps the most central of all Jewish prayers. The blessings which precede the Shema talk of the wonders of nature and the angels, and how all of them join together to praise G‑d. On page 207 we say the Shema itself, in which we declare G‑d’s unity and our fidelity to Him. It is composed of one six-word sentence and then three paragraphs from the Bible. After the Shema, we say another blessing, this time praising G‑d for having taken us out of Egypt. Even if you come late or are overwhelmed by all that reading, be sure to say the Shema. Amidah and Chazzan’s Repetition (pages 211–217): The Shema is followed by the silent “Standing Prayer,” known as the Amidah. We stand facing the front of the synagogue with our feet together, and say the words quietly, in a whisper that only we can hear. a. On the bottom of page 212, there is a responsive bit in which he and the congregation take turns telling how the angels on high praise G‑d. Called Kedushah, it is so special that everyone stands in one place with their feet together. b. Modim D’Rabbanan, which starts on the bottom corner of page 214 and continues on the next page, is a special insert said just by the congregation. c. Last but not least, there are going to be lots of opportunities for you to say Amen. So hold onto your hat! If you miss a few, no need to worry. It takes time to get used to the rhythm of the prayers. 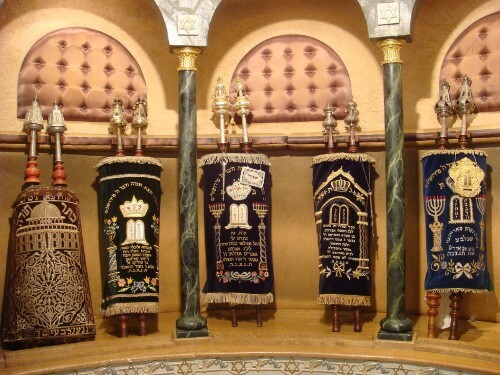 Torah Reading Service (page 222): Our next major landmark is the Torah reading. If you are attending a bar mitzvah, there is a good chance that this is where you’ll see the celebrant and his relatives shine. 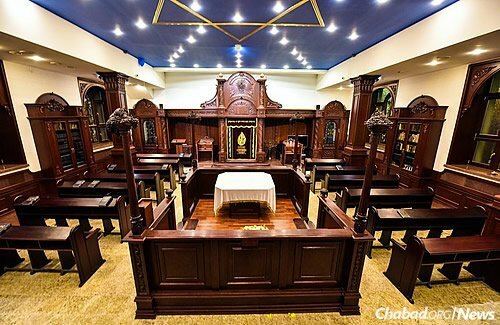 All stand as a Torah scroll is removed from the ark and brought to the bimah (raised table) in the middle of the sanctuary to be read. This is generally accompanied by some communal singing. Now, what exactly will be read depends on the week, since there is a fixed cycle by which the entire scroll is completed every year. The weekly portion (also called a Parshah or sidrah) may very well be the subject of the sermon, so follow along in the language of your choice in the Chumash. During the reading, a series of men are called up to say blessings over the Torah (page 225). This honor is known as having an aliyah. Another portion of the Parshah is read for each consecutive aliyah. This will happen eight times today. When the reading is over, the Torah is hoisted high in the air for all to see. Haftorah (page 228): The Torah reading is followed by the haftorah, a selection from the Prophets related to the Parshah we just listened to, or otherwise pertinent to the time of year. If you read the fine print carefully, you’ll probably be able to locate it in your Chumash as well. Before the Torah is returned to the ark, there are generally some short prayers (starting on page 230) for the wellbeing of the congregation, Torah scholars, the government, etc. This is also the spot when the rabbi shares his sermon. Musaf (Additional) Amidah and Repetition: We are now about to start the second Amidah of the day. By now, you know the drill. We face the front with our feet together, and read silently from pages 234–241. The text is similar to the Amidah we said before the Torah reading. However, since this additional prayer was added to commemorate the additional sacrifices brought in the Temple in Jerusalem, you’ll note that we actually talk about those sacrifices and the Temple during this prayer. Again, the chazzan will repeat the Amidah, following the same routine as before. Once this is done, we’re pretty close to being finished. The congregation will say (or more likely sing) a nice rhyming song called “Ein Kelokeinu” (page 242) and another called “Aleinu” (pages 244–245), and then the service is pretty much over. But wait! There’s more. 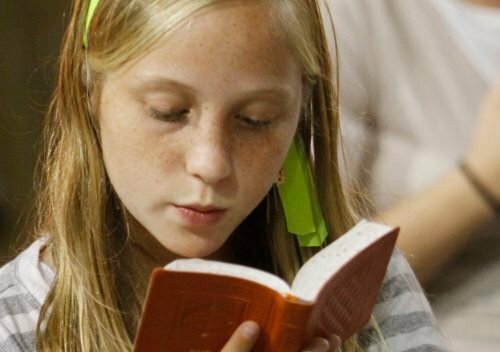 There is a special custom to recite another portion of Psalms daily, completing the book every month. At Chabad, chances are the daily psalms will be announced. You’ll need a separate book in order to do that one. Not to be confused with kaddish, kiddush refers to the brief prayer said over wine, as well as the subsequent reception itself. Once you hear kiddush, sip some wine and feel free to tuck in. You deserve it! 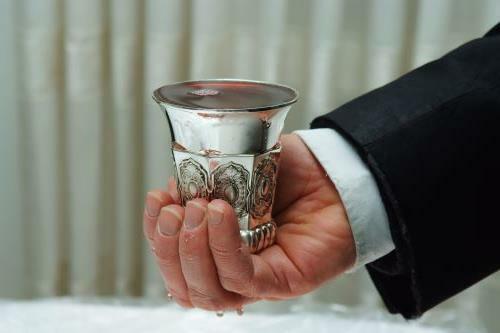 Holding the ceremonial cup of wine for Kiddush or Havdalah. But kiddush is more than just a food-fest. 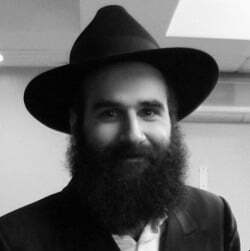 There is a good chance that there will be Torah thoughts, inspirational messages and rousing melodies shared at this point, so listen attentively. Final note: The traditional greeting for this day is either “Shabbat Shalom” or “Good Shabbos.” So make sure to sprinkle your greeting of choice liberally on all the fine folks you meet as you make your exit. Good Shabbos! Will you join me next week? Did you find this informative? This is part of a series of “What to Expect” articles that offer visitors a basic understanding of Jewish rituals and traditions. This is such a well written informative article. assuming you mean women (aka 51%) are observers not participants? You might find some insights as I did from the book, 'To Be A Jewish Woman' by Lisa Aiken. She explains how much (most!) of Jewish life takes place outside the synagogue, often under the control of women. She points out how patriarchal and misogynistic thinking, not Judaism, de-value women's roles/mitzvot while elevating men's.